Universal, super strong 2-component polyurethane adhesive for the most difficult joints. Super strong, gap filling, weather and (sea) water resistant. Suitable for all bonding with high requirements for durability, strength, impact and shock resistance, temperature resistance and (sea) water resistance. Such as boats and caravans. Also suitable for super strong bonding of large surfaces. Ideal for bonding many materials such as metals, many types of wood, stone, concrete, ceramic wall and floor tiles, glass, rubber, many synthetics. Also very suitable for bonding PVC film, artificial grass or tactile tiles to concrete, mirrors, carpeting to polyester (boats), tiles to tiles and insulation material to metal. Not suitable for bonding of bitumen, polyethylene (PE), polypropylene (PP), silicon rubber and PTFE. Preparation Working conditions: Do not use in temperatures ≤ +5°C. Personal safety: It is recommended that rubber or plastic gloves are worn. Surface requirements: The surface must be clean, dry, free of dust and grease. Preliminary surface treatment: Surfaces should be clean, dry and free of dust and grease. If necessary, degrease parts with Bison Degreaser or acetone. Smooth surfaces should first be roughened with sandpaper. In case of wood bonding, the wood humidity content may not exceed 18%. Tools: Mixing tray (clean and dry), putty knife or glue spreader. 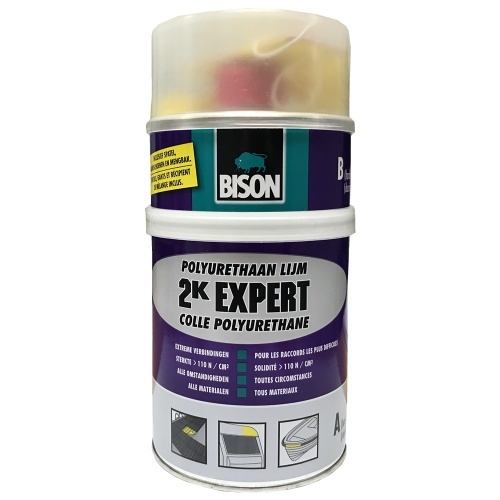 Thoroughly clean tools immediately after use with Thinner for Bison Kit ® or acetone. * Curing time may vary depending on a.o. surface, product quantity used, humidity level and ambient temperature.